One fun way to spruce up a plain knitting project is to add color. However, working color in the round brings its own set of challenges. Here are some ideas for getting around the obstacles. When you want to create a stripe, work to the end of the round with your current color of yarn (called color A here). Cut yarn A, leaving a 6-inch tail, and drop the tail to the inside of your work. 1 stitch, leaving a 6-inch tail. Continue to knit with color B until you have worked 1 complete round. 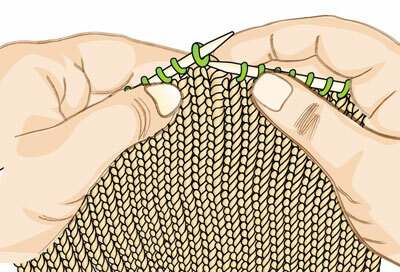 Insert the tip of the right-hand needle into the center of the stitch below the first stitch of color B (a). Lift this stitch onto the left-hand needle (b). Knit the lifted stitch (in color A) and the next stitch (the first stitch of color B) together as shown in the photo. Then knit with color B normally to the end of the round. Continue working with color B for as many rounds as your pattern specifies. Repeat steps 1–3 each time you want to work a round in a new color. This technique moves the end of the round one stitch to the left. This means that as you build a tube with many stripes, you will notice your beginning-of-round marker gradually drifting left away from your original cast-on tail. When you are creating very thin stripes (only one or two rounds high and in only two colors), you can carry your yarn along the inside of your work instead of cutting it when changing colors. However, for thicker stripes, it’s best to cut the old color before starting to work with the new color. Not cutting the yarn when carrying it up more than two rounds will create floats of yarn on the wrong side of your work that can catch on things and become loose and unattractive. Stranded colorwork involves knitting small patterns across the surface of your work, carrying colors as you go. It is actually much easier to work in the round than to work flat. In flat knitting, you have to work the pattern on both the right (knit) and wrong (purl) sides and working colorwork on the wrong side is no picnic. You can’t see the pattern clearly because the wrong side is facing you. 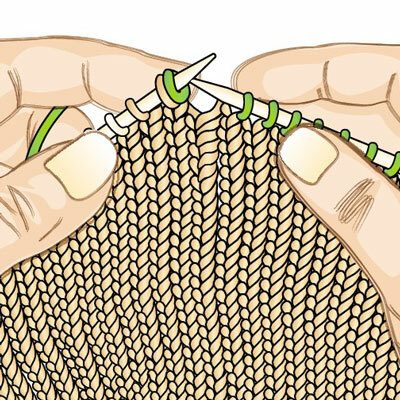 Without the visual cue of the previous rows to guide you, it is easy to work a stitch in the wrong color. 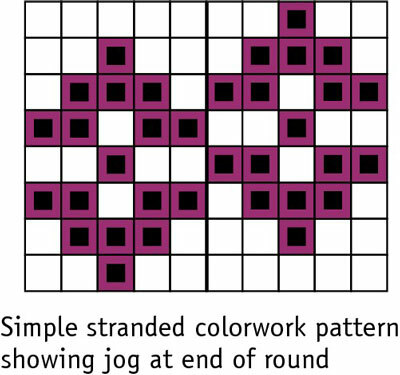 One downside to working stranded colorwork in the round is that you will encounter jogs. You can use the previously outlined method for hiding the jog in stripes, but that can be difficult in a complicated pattern. 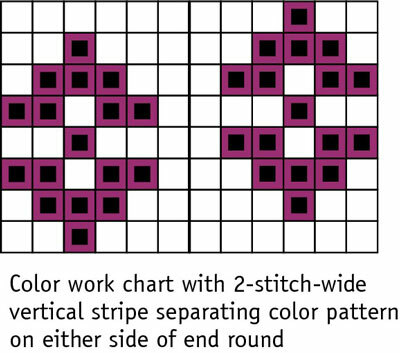 If your colorwork chart includes a column of a single color, consider working the chart so that that column falls at the beginning or end of the round, which will make the jog less noticeable. You can also modify your stitch pattern to add a narrow vertical stripe where the jog would be visible, such as at either side or the underarm of a sweater (b). If none of those options appeals to you, then be sure to position the end of the round where the jog will be less visible. If you are knitting socks, let the end of the round fall at the back of the leg. 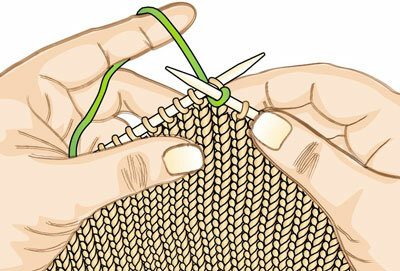 If you are knitting mittens, put the end of the round on the side of the hand opposite the thumb. Intarsia is a type of knitting that uses different colors to create a motif or pattern that involves large blocks of color. With very large blocks of color, it becomes impossible to strand the unused yarns along the back of the work, so instead, you introduce a new strand for each section of color. 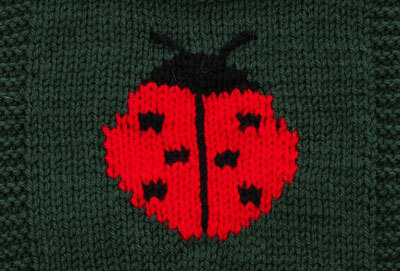 An example of intarsia is a sweater with a knitted-in picture of a ladybug in the center. You typically work this kind of knitting flat; it does not lend itself well to being worked in the round. If your heart is set on an intarsia pattern, work it flat rather than in the round.